On Wednesday the Berlin public prosecutor's office and the state criminal police provisionally seized 77 properties, including apartments, houses and land belonging to members of the "Lebanese" Kurdish extended family "Remmo" worth an estimated 9.3 million euros. These seizures were based on evidence that the properties was likely purchased with proceeds from crime using new rules under the German Criminal Code (StGB) and Criminal Procedural Order (StPO) enacted 1 July 2017. Modelled after Italy's own organised crime laws on property seizure, where the state may order the seizure of property that a person of interest is able to dispose of when the value of the property is disproportionate to the person’s declared income or economic activity, Germany's new law regulates the recovery of criminal proceeds and serves to effectively confiscate illegal proceeds from offenders or third beneficiaries who can be tied to proceeds from criminal transactions. This is the same organised crime family, one of the grandfamilies of Lebanese-Kurdish descent, who immigrated to Germany during Lebanon's 1975-1990 civil war, and who were written about previously on this blog in relation to their involvement in the eye-popping March 2017 theft of a 100-kilogram gold coin stolen from the Münzkabinett (coin cabinet) at the Bode Museum in Berlin. One year ago, in July of 2017 police arrested three members of this Mhallamiye kurdish family, Abdul, Ahmed, and Wissam Remmo, each on suspicion of involvement in the museum theft along with a fourth suspect, an employee of the Bode museum who held a subcontracting job as a supervisor. The Big Maple Leaf coin, made of 99.999 percent pure gold, was (once) the largest coin ever to have been minted. Unfortunately, the object has never been recovered and likely has been melted down and its proceeds used by other criminal accomplices. Authorities began looking more closely into the transactions of the Remmo clan in 2014, when members of the clan were tied to involvement in a spectacularly violent bank heist in the outskirts of Berlin. 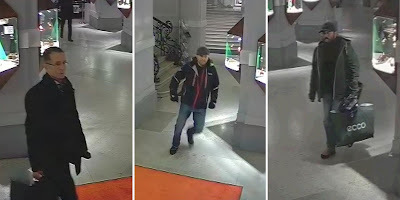 During that robbery heavily armed gunmen with sub-machine guns rounded up and threatened bank employees and cleaning staff before making off with €8 million in valuables from the suburban bank's safety deposit boxes. Using DNA found at the crime scene, Toufic Remmo, 33, was convicted and sentenced to eight years in prison for his role in the offence. During the current investigation, financial investigators of the State Criminal Police Office searched 13 locations in Berlin and Brandenburg tied to 16 members of the Remmo clan allegedly believed to have ties to proceeds from ongoing criminal activity. According to state officials members of the clan have been involved in drug-dealing, extortion, theft and robberies to acquire income-earning real estate for the family group. According to the Berlin police, 14 of the 68 major investigations into organised crime in the city in 2017 involved members of ethnic family crime groups like the Remmos which are difficult to penetrate given the closed familial structures of the clans. This is a list of mafia-tied individuals and cooperating mafia-tied individuals authorities have stated have associations with, or who have directly implicated, Gianfranco Becchina for Cosa Nostra involvement. Giovanni Brusca - Ex Capomafia of the San Giuseppe Jato family. Incarcerated. Also known as "U' Verru" (in Sicilian) or Il Porco or Il Maiale, (In Italian: The Pig, The Swine) or lo scannacristiani (christian-slayer; in Italian dialects the word "christians" often stands in place of human beings). The information he provided regarding Becchina has not been made public though it appears to implicate Becchina with having had a relationship with Francesco Messina Denaro and fencing of antiquities. Calculating and violent, Brusca is known to have tortured the 11-year-old son of a mafia turncoat or pentito to get him to retract statements made to the authorities in connection to the Capaci massacre. After holding the boy hostage for 26 months, he strangled the child and dissolved his body in acid. 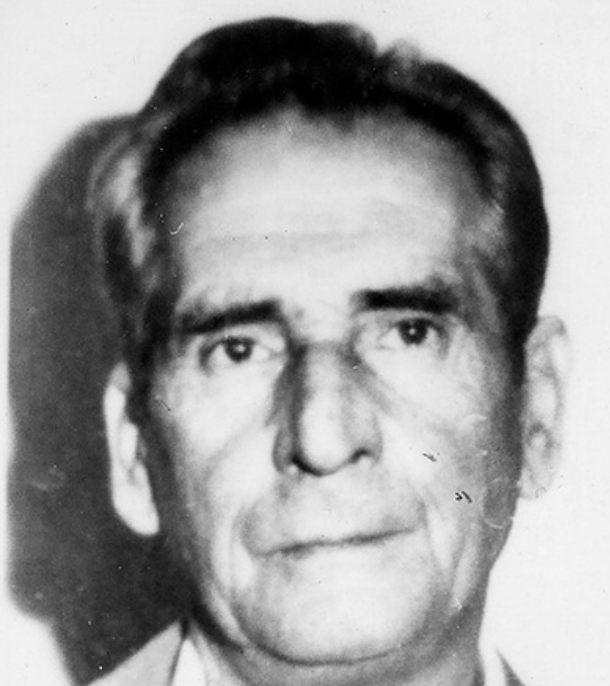 Brusca once stated that he had killed "between 100 and 200" people with his own hands but was unable to recall exactly how many murders he had participated in or ordered. Brusca is also responsible for detonating 100 kilograms of TNT in 1992 under the highway between Palermo and the Punta Raisi airport in a bomb attack which murdered anti-Mafia magistrate and prosecutor Giovanni Falcone, Falcone's wife and five of his bodyguards. In 1993 Brusca mounted further bombing raids throughout mainland Italy hoping to intimidate politicians into reversing decrees for tougher jail regimes for incarcerated mafiosi. This wave of bombings in Florence, Milan and Rome left 10 people dead and injured 70 others. Later, after his arrest, and through a series of strange accords, Brusca also turned informant, though much of his testimony has, at times, appeared to be self serving. His testimony has afforded him controversial and exceptional treatment in direct contrast with his previous level of lethality. 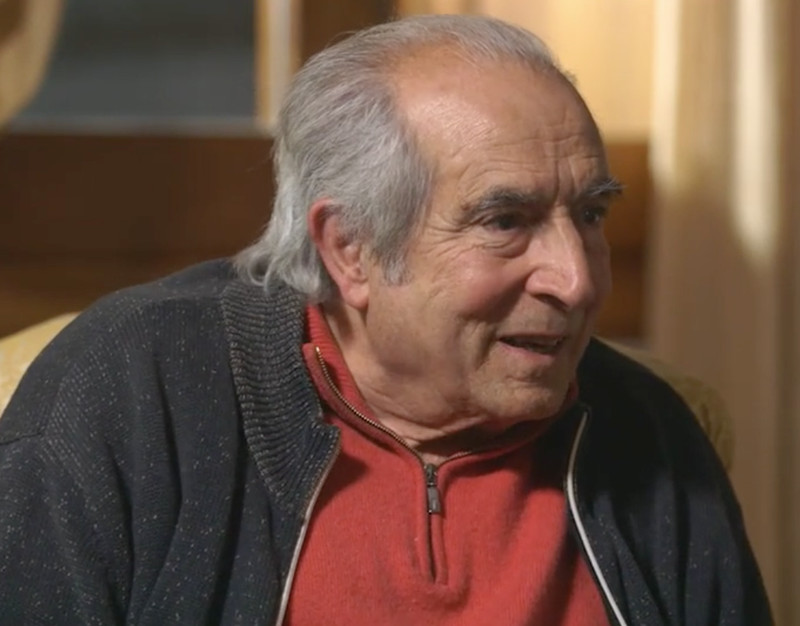 According to some of the testimony released, Messina Denaro was given the job of picking which paintings to target in the Florence bombing that ripped through a wing of the world famous Uffizi gallery because of his knowledge of art. He is currently sentenced to life in prison. 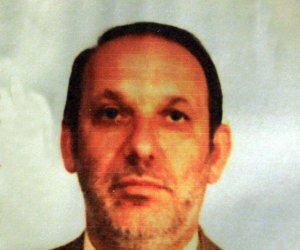 Rosario Cascio - Mafia Associate to several bosses in multiple families including the fugitive Matteo Messina Denaro of the Castelvetrano family. Incarcerated. A Sicilian building magnate known as the "cashier of Cosa Nostra." At one time had a hit put out on him by mobster Angelo Siino only to have Matteo Messina Denaro intervene on his behalf. Cascio managed the family's economic activities and sub-contracts, and monopolized the concrete market and the sale of and construction equipment. Through these he steered public contracts towards mafia businesses and managed an extortion racket which imposed sub contracts and labor. In 1991 Cascio became connected with Becchina's Atlas cements Ltd., and took over as reference shareholder and director. 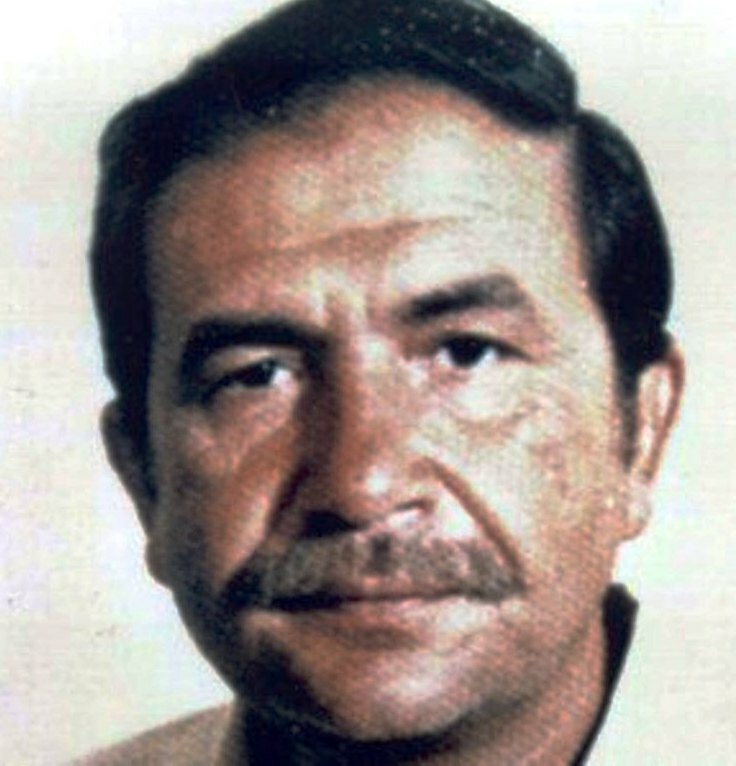 Vincenzo Calcara - exMafia soldier of the Castelvetrano family and collaborator of justice. Former protege of Francesco Messina Denaro. Previously involved in international drug trafficking and money laundering which purportedly implicated the Vatican bank. Calcara was originally tasked to kill antimafia Judge Paolo Borsellino with a sniper rifle but was arrested before he could carry out the plot. Involved in the trafficking of weapons, drugs, and political corruption. Offered a place in the witness protection program but refused. Later Cosa Nostra determined his whereabouts and threatened his wife if she didn't get him to stop talking to authorities. In 1992 Calcara and Rosario Spatola incriminated Becchina for alleged association with the Campobello di Mazara and Castelvetrano clans implying that there was a gang affiliate active in Switzerland whose role was to excavate and sell ancient artefacts on the black market. 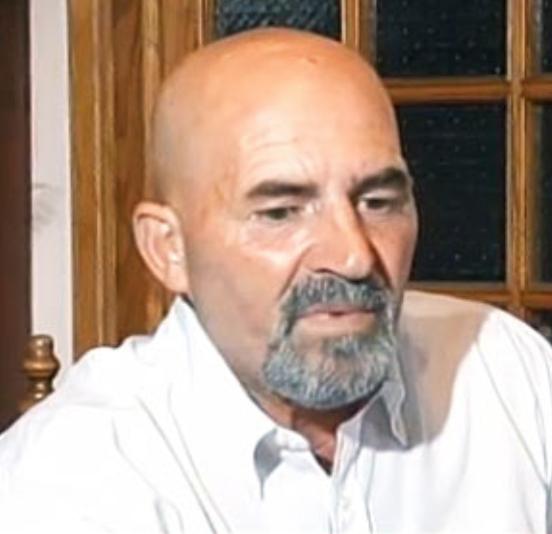 Lorenzo Cimarosa - Mafia declarant and law enforcement collaborator. Deceased. Died as the result of cancer while on house arrest. Cimarosa was married to a cousin of mob boss Matteo Messina Denaro. Cimarosa told authorities about a warning message Becchina received from the mob in January 2012. In that incident, someone fired shots from a shotgun at Becchina's door and left an intimidating gift of flowers. Cimarosa told authorities that he had heard through Francesco Guttadauro, nephew of the boss of the Castelvetrano family, that the incident was ordered by Matteo Messina Denaro himself for non-delivery of payments. Cimorosa indicated that between 70 and 80,000 euros were paid through Becchina regularly. After his death the site where Cimorasa was buried has subsequently vandalized, perhaps as a warning to his wife and son. Francesco Messina Denaro - Capo Mandamento of the Castelvetrano family. Deceased. Died in hiding in 1998 while a fugitive from justice. Father to Matteo Messina Denaro who took over his father's enterprise. 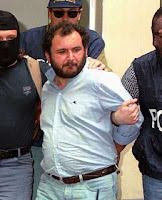 Francesco, also known as Don Ciccio, headed up the Castelvetrano family from 1981 until 1998 and was a member of the Cupola (Mafia Commission) of the Trapani region from 1983 until his death in 1998. He was a close ally to the Corleone faction led by Salvatore "Totò" Riina and Bernardo Provenzano. Purportedly had ties to Becchina relating to the theft, looting, and laundering of antiquities. Matteo Messina Denaro - Boss of the Castelvetrano family. Also known as "Diabolik." Fugutive. 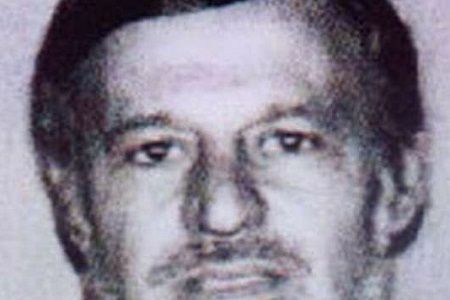 Solidified his position in the mafia following the arrests of two of his predecessors, Salvatore "Totò" Riina in 1993 and Bernardo Provenzano in 2006. A fugitive since 1993, he has been convicted in absentia for the Sicilian mafia's bombing campaign in the early 1990s, which killed magistrates and bystanders in Sicily, Rome and Florence which killed ten people and injured 93 others. He once boasted "I filled a cemetery all by myself." 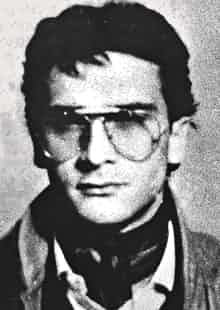 According to Giovanni Brusca, Matteo Messina Denaro was the facilitator of the 1993 Uffizi gallery bombing in Florence. In that incident a Fiat car packed with 100kg of explosives detonated killing six people, and destroying three paintings - two by Bartolomeo Manfredi and one by the Gherardo delle Notti. He was also implicated in the bombing of the Basilica of St. John Lateran in Rome. Becchina allegedly passed envelopes of money to Denaro's brother in law and sister. 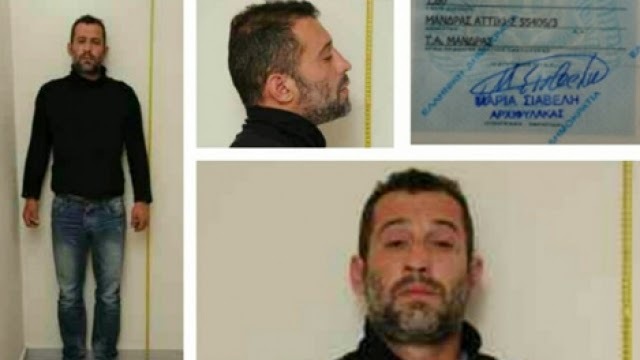 Investigative seizures made by authorities in connection with this Cosa Nostra boss are so extensive it is hard to tell where the economy of western Sicily stops and Denaro’s mafia-controlled empire begins. Patrizia Messina Denaro - Sister of fugitive Boss and Capodonna representative of the Castelvetrano family. Incarcerated. Serving a 14 year and 6 months sentence for acting as stand in Capo Donna for her brother. She was found guilty of being a full member of the Mafia and not an affiliate mafia. Several firms including an olive-oil company belonging to her and her husband were impounded and a number of bank accounts frozen. 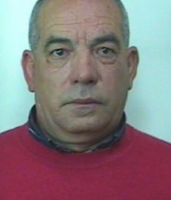 Francesco Geraci - Mafia associate to Boss of Bosses Salvatore "Totò" Riina of of the Catania Family. Incarcerated. There are two Cosa Nostra affiliates in custody with this same name. One is the nephew and one is son of a deceased capomafia of the mafia family of Chiusa Sclafani. It is unclear at this time which is cooperating with authorities. Giuseppe Grigoli - Mafia associate to the Castelvetrano family and law enforcement collaborator. Incarcerated. Also known as "Grigg." Former owner of a chain of Despar supermarkets in Sicily, convicted of being the entrepreneurial arm of fugitive Messina Denaro’s organisation using his retail and distribution group to launder Matteo Messina Denaro's cash. Told the PM of the District Anti-Mafia Directorate of Palermo that between 1999 and 2006 he was given envelopes filled with money by Becchina which were to be delivered to Vincenzo Panicola, the husband of Matteo Messina Denaro's sister Patrizia Messina Denaro. These exchanges were said to have taken place in the former offices of 6Gdo, the distribution chain confiscated just at the time of his arrest. Concetto Mariano - Mafia Associate of the Cosa Nostra Marsala family and law enforcement collaborator. Incarcerated. Mariano began cooperating with justice officials two months after being arrested. Implicated Becchina in a plot to steal and fence in Switzerland the bronze statue of the Dancing Satyr, attributed by scholars to Praxiteles housed at the Piazza Plebiscito Museum in Mazara del Vallo. Vincenzo Panicola - Mafia associate. -Incarcerated. Brother-in-Law of fugitive Castelvetrano boss, Matteo Messina Denaro. Husband of Patrizia Messina Denaro, sister of the boss. Worked with mafia associate Mafia associate to the Castelvetrano family, Giuseppe Grigoli. Convicted in 2013 to ten years in prison. Several firms including an olive-oil company belonging to him and his wife were impounded and a number of bank accounts frozen. Santo Sacco - Mafia associate - Incarcerated. 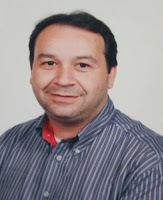 A former UIL trade unionist and city councillor for Castelvetrano, Sacco was sentenced to 12 years for is affiliations with Matteo Messina Denaro in the control of various business activities, including alternative energy as well as activities in support of the families of mobsters incarcerated. Wiretaps of conversations with Becchina show collusion towards vote fixing and influence peddling in support of the election campaigns of Giuseppe Marinello and Ludovico Corrao. 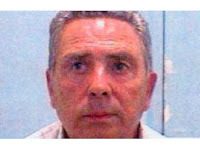 Angelo Siino - Mafia associate to the San Giuseppe Jato family. Incarcerated. Often referred to as Cosa Nostra's "ex-minister of public works". A businessman who oversaw whose principal duties were to oversee mafia public sector affairs through the illegal acquisition of public work contracts. Siino would receive the lists of public contracts before they became publicised and through through threats and extortion, insure that these contracts would be awarded to mafia influence coalitions, thereby controlling the market for public contracts in Sicily. Rosario Spatola - Law enforcement collaborator. Deceased. A former drug dealer who passed information in the 1990s to Judge Paolo Borsellino on drug trafficking in Trapani area and the role of the clan led by Boss Francesco Messina Denaro. 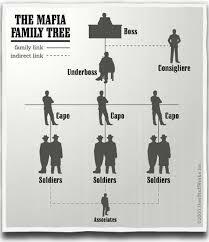 Believed by some not to be a true member of Cosa Nostra as his father was a policeman making his membership void. 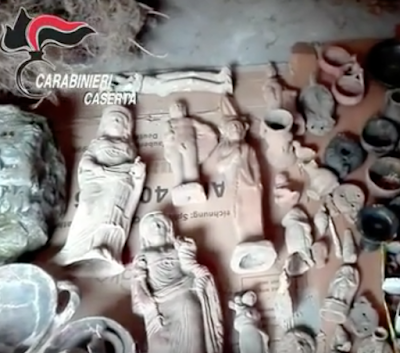 In 1992 Spatola and Vincenzo Calcara, incriminated Becchina for alleged association with the Campobello di Mazara and Castelvetrano clans implying that there was a gang affiliate active in Switzerland whose role was to excavate and sell ancient artefacts on the black market. At the time much of his testimony was discounted as many were skeptical that he had actual knowledge or invented things to his own benefit. For more details on this case please see the following to blog posts here and here. Il vento sta cambiando, updates on Gianfranco Becchina asset seizure, fire, and vote fixing. Politics and mafia are both powers which draw life from the control of the same territory; so they either wage war or come to some form of agreement. Yesterday ARCA reported on the assets seizures involving 78-year-old Gianfranco Becchina, an action taken in relation to probable collusion with the Sicilian mafia, Cosa Nostra. The disgraced Italian antiquities dealer was convicted in the first degree in 2011 for his role in the illegal antiquities trade. A portion of his accumulated business records, up until 2002, were seized earlier by Swiss and Italian authorities during raids conducted on Becchina’s Swiss art gallery, Palladion Antique Kunst, as well as two storage facilities inside the Basel Freeport, and another elsewhere in Switzerland. This archive of documents and photos, known as the Becchina archive, consists of some 140 binders containing more than 13,000 documents and photos related to antiquities, bought and sold, which at one point or another are known to have passed through this dealer's network of illicit suppliers. Yesterday Italy's Anti-Mafia Investigative Directorate (DIA), through the Court of Trapani's penal and preventive measures section, moved to seize all movable assets, including real estate and corporate enterprises attributable to Becchina on the basis of an order issued from the District Attorney of Palermo on the basis, L'associazione di tipo mafioso. Mafia association is a formal criminal offense provided for by the Italian penal code introduced into law via article 416-ter of Law no. 646/1982, and designed to combat the spread of the Mafia. "Any person participating in a Mafia-type unlawful association including three or more persons shall be liable to imprisonment for 7 to 12 years. Those persons promoting, directing or organizing the said association shall be liable, for this sole offence, to imprisonment for 9 to 14 years. Mafia-type unlawful association is said to exist when the participants take advantage of the intimidating power of the association and of the resulting conditions of submission and silence to commit criminal offences, to manage or at all events control, either directly or indirectly, economic activities, concessions, authorizations, public contracts and services, or to obtain unlawful profits or advantages for themselves or for others, or with a view to prevent or limit the freedom to vote, or to get votes for themselves or for others on the occasion of an election. Should the association be of the armed type, the punishment shall be imprisonment for 9 to 15 years pursuant to paragraph 1 and imprisonment for 12 to 24 years pursuant to paragraph 2. An association is said to be of the armed type when the participants have firearms or explosives at their disposal, even if hidden or deposited elsewhere, to achieve the objectives of the said association. If the economic activities of which the participants in the said association aim at achieving or maintaining the control are funded, totally or partially, by the price, the products or the proceeds of criminal offences, the punishments referred to in the above paragraphs shall be increased by one-third to one-half. The offender shall always be liable to confiscation of the things that were used or meant to be used to commit the offence and of the things that represent the price, the product or the proceeds of such offence or the use thereof. The provisions of this article shall also apply to the Camorra, ‘ndrangheta and to any other associations, whatever their local titles, even foreigners, seeking to achieve objectives that correspond to those of Mafia-type unlawful association by taking advantage of the intimidating power of the association." To further dismantle Matteo Messina Denaro’s operational funding, Italy's Anti-Mafia Investigative Directorate (DIA) moved to seize Becchina's cement trade business, Atlas Cements Ltd., his olive oil company, Olio Verde srl., Demetra srl., Becchina & Company srl., bank accounts, land, and real estate properties including Palazzo Pignatelli yesterday. Palazzo Pignatelli is part of the ancient Castello Bellumvider, a separate portion of which is owned by the city of Castelvetrano and houses the town hall. During the execution of the seizure of assets at Palazzo Pignatelli, a fire mysteriously broke out in a first-floor study, located in Becchina's wing of of the property. Called on the scene, fire department officials extinguished the flames yesterday and returned for a second time today, along with the DIA and scientific police to uncover any traces that would determine the cause of the fire. The seizure of these Becchina assets comes following the cooperation of mafia associate/police informant Giuseppe Grigoli, known in wiretaps as Grig. Grigoli once owned a chain of Despar supermarkets in northwestern Sicily, used to launder mafia proceeds into the legal economy. Starting out in 1974 as the owner of one grocery, Grigoli parlayed his relationship with Cosa Nostra, building a business empire which was once valued as a 700 million euro enterprise. The Italian authorities seized Grigoli's assets when they tied him to mafia transactions through banking documents from 1999 through 2002, when the "king of supermarkets" was at the height of his business success. The arrest and conviction of Grigoli proved to be the tip of the Trapani Cosa Nostra iceberg and served to flush out many players in the hidden network of strategic partners that facilitate the activities of fugitive Castelvetrano boss, Matteo Messina Denaro, including now, Gianfranco Becchina. As a now cooperating police informant, Grigoli told the PM of the District Anti-Mafia Directorate of Palermo that between 1999 and 2006 he was given envelopes filled with money by Becchina which were to be delivered to Vincenzo Panicola, the husband of Matteo Messina Denaro's sister Patrizia Messina Denaro. But Becchina's mafia influence doesn't apparently stop at trafficking of antiquities and aiding and abetting a mobster on the run. An article written in today’s La Repubblica by journalist Salvo Palazzolo, reports that during a 2001 Carabinieri TPC wiretap into Becchina’s role in the illicit trafficking of antiquities, law enforcement authorities overheard conversations between Becchina and Santo Sacco, a former UIL trade unionist and city councillor for Castelvetrano, who was later sentenced for mafia association. 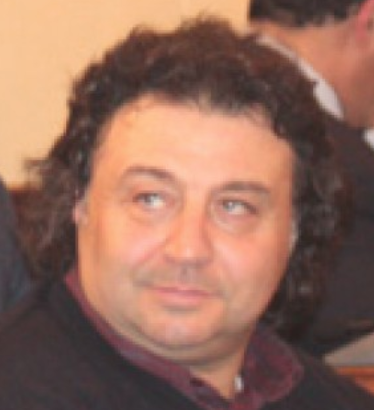 In police transcripts of those conversations Becchina implicated himself as being involved in vote fixing in support of the election campaign of Giuseppe Marinello, from the People of Freedom party, who, at the time, was running for a seat in the Chamber of Deputies representing Sciacca in Sicily. In their conversation Sacco also boasted about his role in the campaign of Ludovico Corrao saying "But I fully carried inside an iron bell ... I'm not kidding, 6,400 votes..." Both incidences clearly show the impact of organized crime on parliamentary elections in Sicily. In a mysterious wrinkle to this story, ex senator Corrao was later the victim of a gruesome murder. 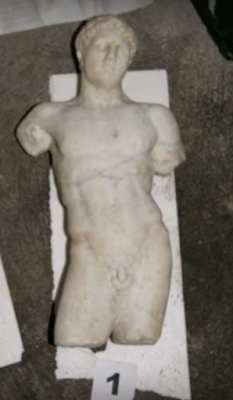 In 2011 his throat was found cut with a kitchen knife, nearly decapitating his head, both wrists had been slashed and he was left in a bloody pool having apparently also been bludgeoned with a statuette. After the slaughter, Seiful Islam, a Bangladeshi servant, called the police and confessed to the murder. Islam later attempted suicide while in custody and was found not guilty by reason of unsound mind and transferred to a psychiatric facility. Organized crime is detrimental not just to art, but to the functioning of a society. This week, in the town of Teano, 30 kilometres northwest of Caserta on the road to Rome from Naples, the Carabinieri formally placed under investigation four individuals under suspicion of having committed a series of thefts “of historical interest” and then selling their stash onward via the illegal market. In layman's English, the men were arrested for trafficking illicit antiquities and laundering them on via middlemen on to wealthy buyers. The archaeological areas of Teano-Calvi have long been massacred for decades by tomb raiders without scruples. One of those arrested was Emilio Autieri, a 65 year old registered nurse with Italy's Local Health Authority Service (Azienda Sanitaria Locale, ASL) which proves that even with a decent state pension, individuals can be coaxed into a world of illicit crime where money flows freely and behind closed doors. He and 22 year old Antonia Pane have been placed under house arrest pending further investigation. Massimo Aversano, 43 and 19 year old Domenico De Biasio have been released on their own recognizance with reporting conditions and restrictions to not leave the territorial area. The investigation began in January 2016 following a not-publicized theft from the Archaeological Museum of Teano. 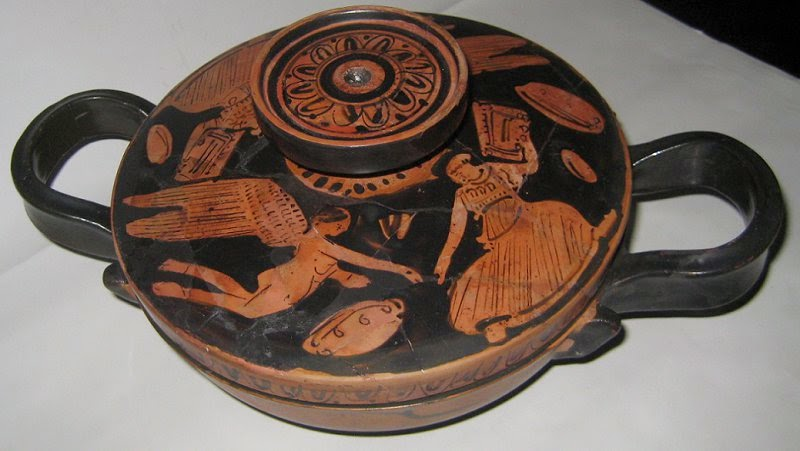 The case serves as a good example into the minds of criminals who receive, possess, conceal, store, barter, and sell, not just antiquity, but any goods, wares, or merchandise where there is a willing buyer willing to look the other way. Following months of observation and chasing leads on various burglaries at private residences and shops, the Teano carabinieri conducted a series of wire taps and reviewed CCTV footage related to various burglaries. This in turn lead them to execute search warrants which uncovered what appears to be a well structured group of organized criminals who moved objects via fences working in the archaeological sector who had a supply of buyers willing to turn a blind eye to the illicit origin of the pieces they purchased. 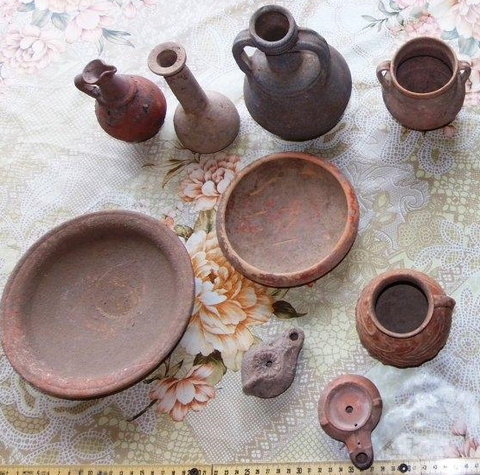 During the July sting operation, authorities recovered and sequestered more than 200 historical objects; antiquities which initial examination appears to date from from as early as the 9th and 8th Century BCE to as late as the 1st and 2nd century CE. Law enforcement has estimated the value of the seizure to have a combined value of €500,000.00 on the illicit market. 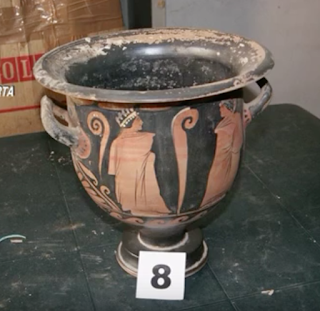 The objects brought into police custody include various sculptures in terracotta, ivory carvings, marble architectural elements, terracotta amphorae, as well as Bucchero pottery, common in pre-Roman Italy. The team also had a stash of votive statues, and various metal and stone objects, buckles, brooches and earrings. 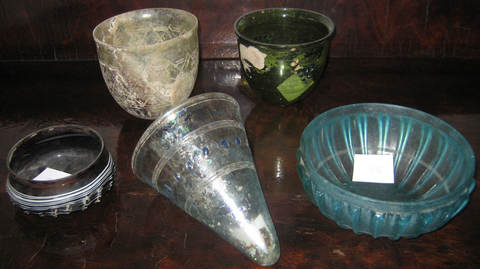 Interestingly, authorities also seized stolen objects not of an archaeological nature. This shows that the ring of thieves and fences, did not restrict their dealings to stolen goods solely from antiquity. 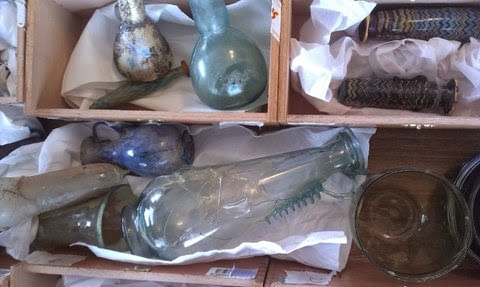 Earlier, in March of this year, a well-respected surgeon, Domenico Bova from nearby Sessa Aurunca and Gerardo Mastrostefano, an attorney from the same town as this weeks arrests, were investigated for their own related involvement to this offence and receiving stolen archaeological goods after 33 ancient finds were confiscated from their individual residences. Along with them an unnamed fence was reportedly involved as the ring's middleman. The investigation into these prior individuals coupled with this week's formal charging of four others seem to lend credibility that the zone continues to have weaknesses that in the past have made it well adapted to the trafficking of culture. 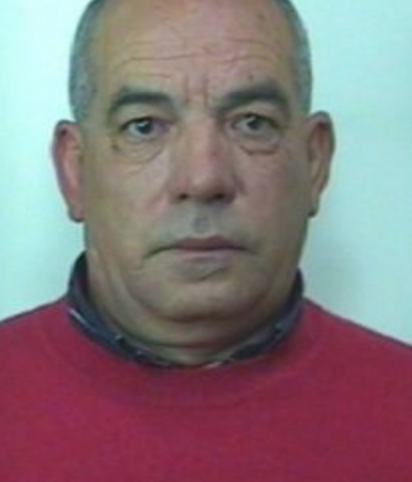 In January 2014 an ex capo and former Camorrista of the Casalesi clan turned justice informant, Carmine Schiavone, stated that the Camorra had infiltrated the cities of Teano, Vairano, Caianello and other areas in Alto Caserta. Schiavone, prior to his death was a former member of the Casalesi clan from Casal di Principe in the province of Caserta between Naples and Salerno and a cousin of former Camorra superboss Francesco Schiavone. Heavily entrenched in the clan's business, he could be considered a person well informed as to the illicit activities in the region. Is this summer's heritage crime case localized to one small group of organized bandits or part of something more sinister? 2015 has barely started and antiquities traffickers have begun making headlines in multiple countries. In this three part series, ARCA will explore three current trafficking cases in detail to underscore that the ownership and commodification of the past continues. 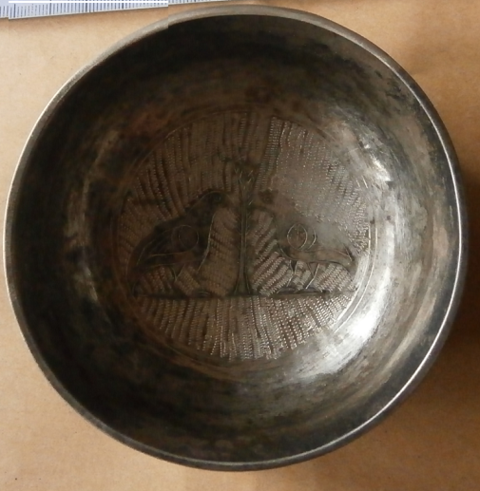 On January 30th the State Agency for National Security (DANS) in Bulgaria reported that it had conducted two significant trafficking investigations into illegally circulated ancient and medieval objects and coins. The two-month long probe started November 26, 2014 and ran until January 26, 2015 during which time DANS officers conducted thirty-six searches in eleven cities seizing a total of 2,289 objects protected by Bulgaria’s Cultural Heritage Act. The Act encompasses intangible and tangible immovable and movable heritage as an aggregate of cultural values which bear historical memory and national identity and have their own academic or cultural value. SANS reported that they detained several individuals for their participation in an organized criminal group trafficking in antiquities but their names have not been currently been released to the public, citing the ongoing nature of the ongoing investigation. From an ancient world perspective, Bulgaria has some of the richest archaeological sites in Europe. From an economic perspective, regions such as Severozapaden, have some of the lowest-ranked economies in Bulgaria and the European Union. That makes archaeologically rich areas, like Ratiaria, which is located on the Danube River, near the modern day city of Archar, in the Vidin District of Northwest Bulgaria particularly vulnerable. With unemployment high and limited work possibilities since the fall of Communism, its not surprising that subsistence looters have treated the site as their own personal Automatic Antiquities Machine. The territory has been so heavily looted in the past twenty years that even a Google Street View car managed to snap shots of a local looting crew while mapping area roads. Working with shovels and metal detectors, looters generally make little, often passing their finds on to local middlemen dealers, like this one arrested in Ruptsi, Bulgaria in in 2011. Hiding in plane sight, the business man was known among the locals and among treasure hunters as an active dealer in cultural goods in the region and was brazen enough to keep a storage of heavier items in his garden. While the number of items seized in this 2015 Bulgarian investigation is distressingly large, the types of objects confiscated are all too familiar to art police who's investigative work revolves around combating heritage looting and smuggling. To those who examine heritage trafficking in search of patterns there are also a few interesting points to consider. The Bulgarian investigators seized everything from pottery and figurines, bronze and precious metal, jewellery of all types, ancient and medieval seals, religious crosses and icons, pieces of marble, and even Thracian weapons and horse-riding decorations. The objects have common denominators: they were, for the most part, easy to traffic because of their small size and they were the types of objects buyers willingly purchase, and with increasing frequency via online auction sites. 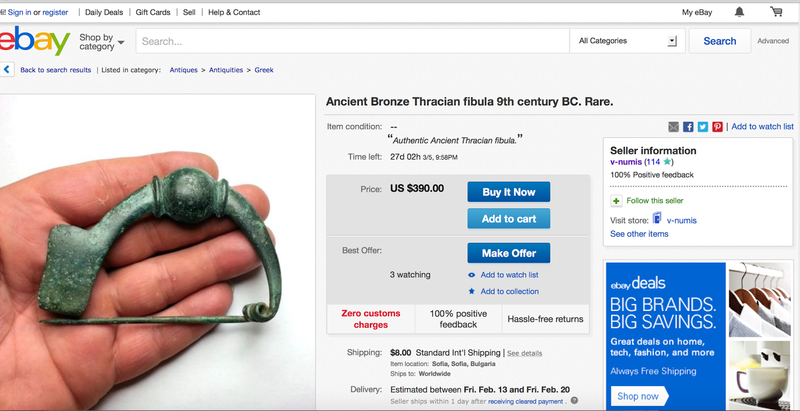 Whether or not these items were destined for sites similar to eBay would be a hypothesis that hasn't be proven, but what we can underscore is that there is an ongoing supply market furnishing ancient objects for online transactions. Platforms like eBay, with millions of auctions annually, are difficult for law enforcement to police, but easy sites for traffickers to navigate to connect with potential buyers internationally. The seller can be relatively anonymous and as their ratings are built on successful sales with satisfied customers, shady dealers can add or drop seller profiles to masquerade as being ethically legitimate. Who is their preferred buyer? The individual who is willing to purchase heritage objects from anonymous suppliers. The novice collector or aficionado who is not worried about owning objects which might turn out to be fake or might not have a pristine collection history that explains the context of the item, where it has originated from or who has been its custodian up until the point of sale. 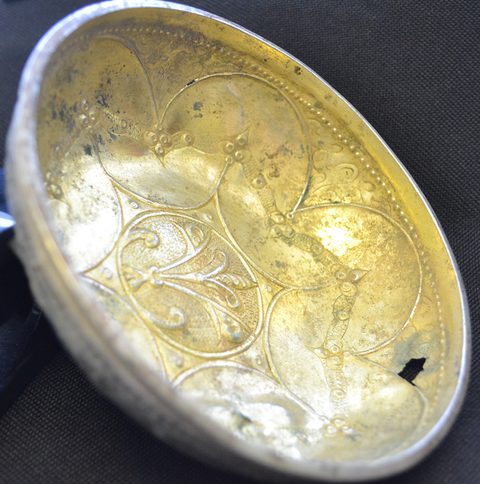 For the purpose of this article ARCA has highlighted three current online auctions with similar Bulgarian items to those seized during the Aureus investigation. 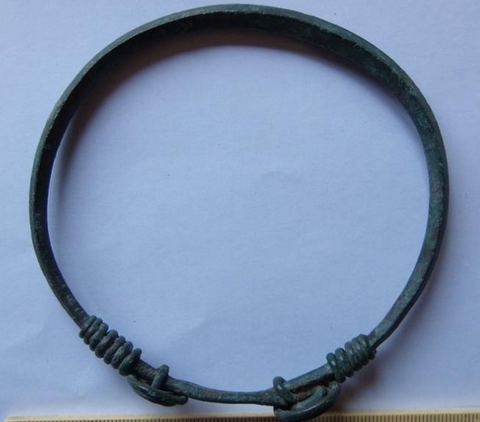 Auction I lists a purported 9th century BC Ancient Bronze Thracian Fibula. 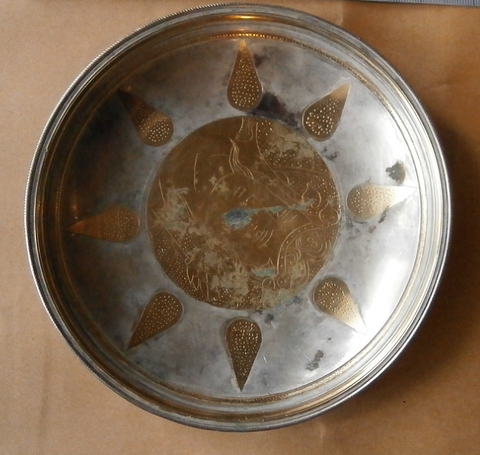 The object was being offered by a seller in Bulgaria but listed nothing in the way of collection history as was absent in most of the auctions we viewed. Provenance isn't something auction participants seem to require in order to consider an item attractive for purchase. 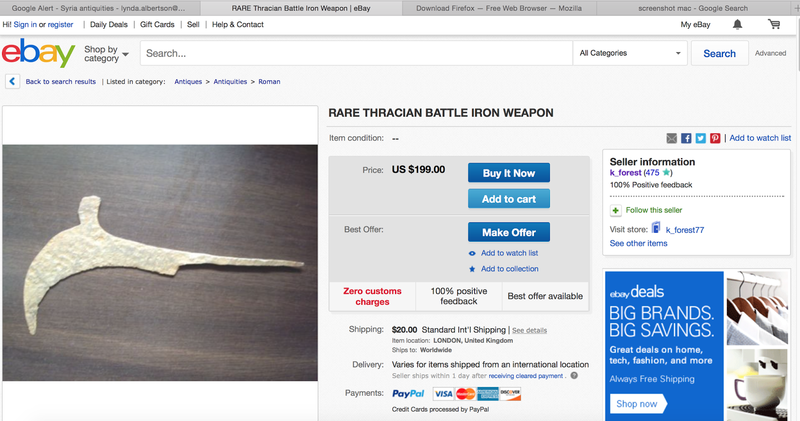 Auction II claims to be of a rare iron Thracian battle weapon, CIRCA IV-Ic. B.C. 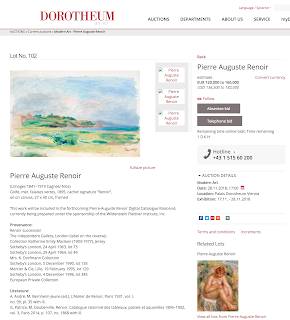 This auctioneer is reportedly UK-based, applying a layer of legitimacy, but the item's auction detail states the object will be shipped to the buyer "from Eastern Europe". Again there is no collection history and the buyer is far removed from the trafficker. 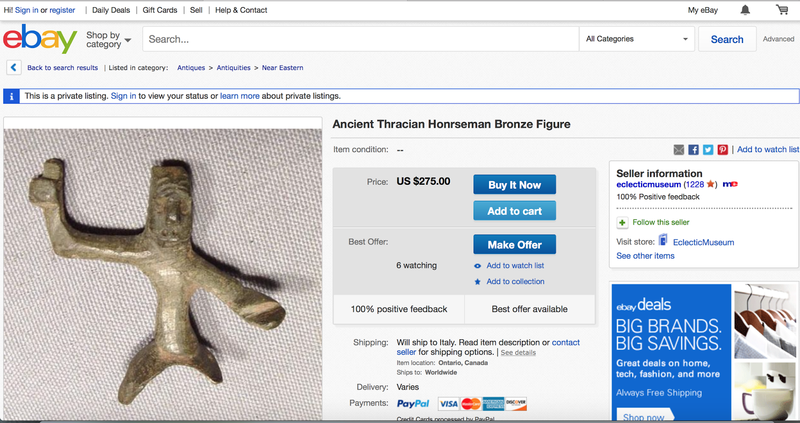 Auction III lists an object on sale described as an Ancient Thracian Honrseman Bronze Figure. This auction item has purportedly travelled a long way and is now being sold by a Canadian antique trader, again without benefit of a collection history indicating how it made its way to North America. The seller does not appear to be a novice, and states he has been in the trading business since 1970. During the Bulgarian DANS investigation law enforcement officers also seized metal detectors and specific geophysical detecting instruments used to determination of the exact position and depth of objects while still in the ground thus showing that these devices are not used exclusively by law-abiding recreationists willing to abide by established laws. Like with Italy's Gianfranco Becchina case, officers confiscated binders with multiple photos, auction house catalogs and invoices indicating that the scale of items being sold was a fluid enterprise level operation and not a casual one-off sale. Landscapes of looted terrain in Bulgaria have a similar moonscape pattern to those we have seen repeatedly in satellite imagery in Syria and Iraq. This should be highlighted as proof that large-scale antiquities looting is not solely a funding source for criminal groups such as ISIS in conflict zones but also a source for revenue streams in economically challenging areas with a high rate of under or unemployement. 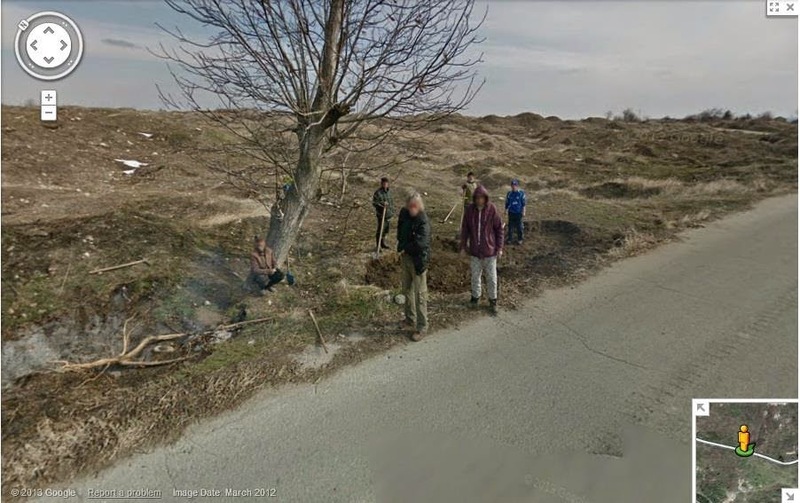 In this Google Street View image one can see an example of the looting pits that cover large swaths of Bulgaria terrain as well as a brazen group of looters working in broad daylight as an organized team. In addition to searching workshops, DANS agents undertook an evaluation of Bulgaria's largest private museum in search of irregularities. The businessman who owns this vast collection was listed in law enforcement press releases using his initials, "VB". Bulgarian press have indicated that the initials represent millionaire Vasil Bozhkov who is known to have a vast collection of Roman, Greek and Thracian works of art and who's coin collection is listed as one of the most extensive in the country. Bozhkov is also the founder of The Thrace Foundation an organization active in heritage-based events. Previously, in January 2009, Petar Kostadinov published an article reporting that Vassil Bozhkov and Bulgarian prosecutor Kamen Mihov were alleged to have been involved in government-level corruption plot devised to prevent the extradition of international art dealer Ali Abou’Taam to Egypt on antiquities trafficking charges. The allegations presented in the newspaper article cited an email published by Dutch private art investigator Arthur Brand to the Museum Security Network mailing-list. A representative of Phoenix Ancient Art replied to David Gill's Looting Matters blog with this letter relating to the detention of Ali Aboutaam in Sofia. No mention of Mr. Bozhkov's relationship with the art dealer was made. Eight months later, a diplomatic cable from the US Embassy in Sofia, dated September 11, 2009, released first via WikiLeaks and later republished by the Sofia News Agency Novelite indicated that Bozhkov has been long suspected of having ties to organized crime. On January 14, 2015 the US ambassador to Bulgaria Marcie B. Ries and Bulgaria’s Culture Minister Petar Stoyanovich signed a memorandum of understanding at the National History Museum in Boyana on the outskirts of Sofia. This US/Bulgarian MOU calls for the protection of cultural heritage and is designed to prevent the illicit trade of Bulgarian cultural heritage items into the United states and to allow the return of said items to Bulgaria of any such item confiscated. ARCA will continue to follow this case as details on the investigation are released. Investigating organized crime links with art crimes components is complicated. Sometimes researchers are able to draw detailed maps of criminal enterprise that fuels the illicit art and antiquities trade and other times investigations lead us down windy roads to nowhere, or at least to places where gathering further evidence is not likely and possibly dangerous. Earlier this month Greek news bureaus hit the wires reporting on a series of startling arrests, some involving suspects who liked to mix a little art and culture with their organized crime activities. On Saturday, January 3, 2015 Greece’s anti-terrorism unit captured Christodoulos Xiros; an on-the-run associate of the once-powerful and ultra-violent 17N group (Greek: Επαναστατική Οργάνωση 17 Νοέμβρη ). Xiros had walked away from his prison sentence in January 2014 while on furlough visiting his family during the Christmas holidays. 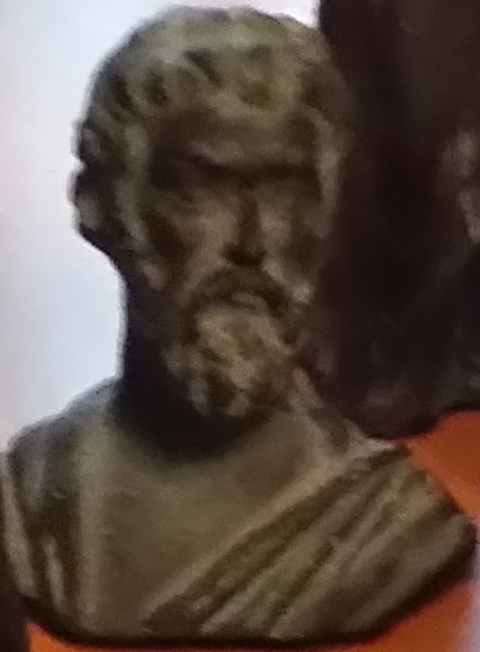 Tracked to the town of Anavyssos in southeast of Athens, Christodoulos Xiros had changed his appearance, let his hair grow out and dyed it blonde. But instead of lying low and enjoying his freedom while on the lam, the escapee chose to taunt Greek authorities; releasing ominous statements that implied he intended to pick up where he left off before his original incarceration for murder began. Less than one month into his escape, Xiros submitted a long-winded manifesto along with a four-minute video to the website Independent Media Center. His untraceable statements, posted online at Indymedia/IMC were laced with violent innuendo alongside governmental and civil rights complaints. 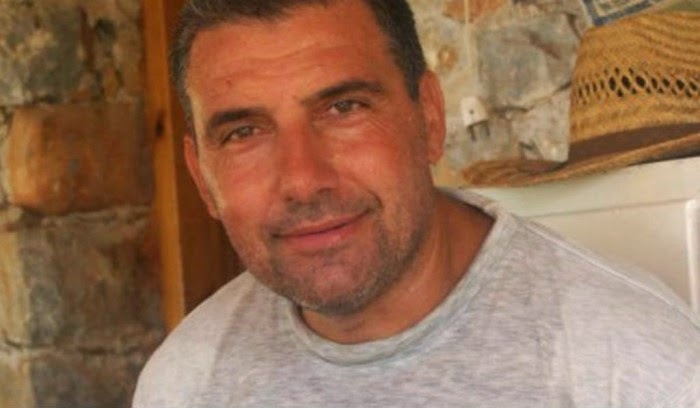 Police Chief Dimitris Tsaknakis informed the press that Greek authorities had been searching for Christodoulos Xiros in and around the Athens’ suburbs for three months. Investigators traced him via informant tips relayed to police, possibly in hopes of receiving part of the reward money being offered for information leading to his capture and arrest. These tips, along with information gleaned from intercepted phone calls and solid gumshoe policing helped track the fugitive and set the stage for his organized apprehension. Xiros had been hiding in relatively plain sight, going by the name “Manolis”. At the time of his recapture, he was armed with a fully loaded Belgian or Hungarian-constructed Browning P35 9mm pistol. News agencies reported that the gun’s serial number and make were scratched out, an action that impeded its traceability. A search of the house where he had been holed up contained an extensive cache of weaponry. 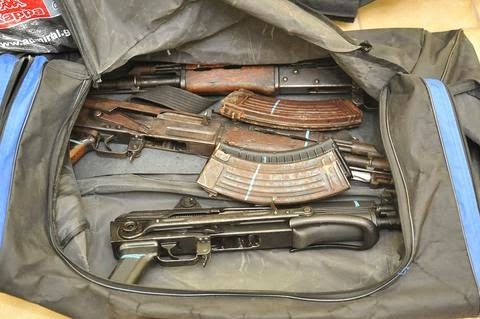 Law enforcement authorities inventoried assault rifles, Magtech 9mm ammunition, a rocket-propelled launcher, RPGs, grenades, six kilograms of explosive-making materials and a plethora of parts used for the manufacture of explosive devices including fuse wire, detonators and ignition wicks. For a complete list of the evidence seized, please click here. 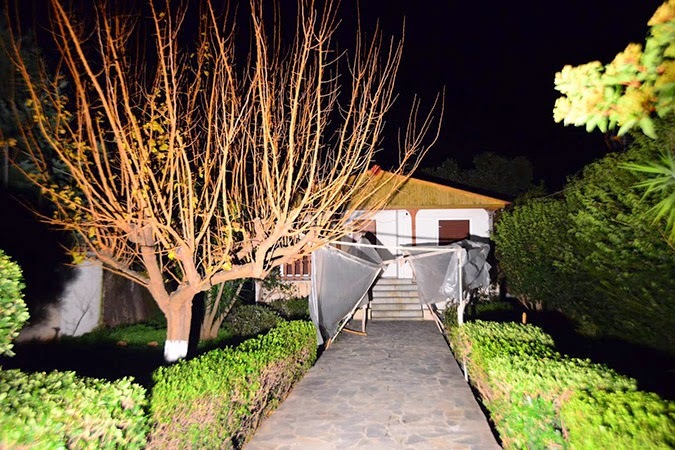 After examining the evidence confiscated from the house in Anavyssos, Public Safety Minister, Vassilis Kikilias told reporters "Greek police prevented a major attack against the heart of the Greek prison system." It seems that alongside the weaponry, police had found a well-developed diagram of the Korydallos prison complex. Authorities believe that in stockpiling arms, Christodoulos Xiros was preparing for an armed assault and possible break-out on the western Athens prison, most likely to occur during Greece’s recent lead-up to the election that was held this weekend. As a maximum-security facility, Korydallos Prison Complex has a notorious reputation. In addition to housing other 17N convicts, it’s also has had its share of movie-worthy prison escapes. Not only did Christodoulos Xiros vanish while on furlough but inmate/kidnapper Vasilis Paleokostas escaped twice, each time using a hijacked helicopter, first in June 2006 and again in February 2009. During the second breakout a nearby resident captured the get-away chopper on amateur video. The grainy footage on this film shows the helicopter rising from the prison grounds and shots can be heard firing in the background while the amateur video maker comments. Korydallos prison is also an over-crowded penal facility that has had substantial civil rights issues, many of which Christodoulos Xiros written manifesto outlined in Robin Hood-esque detail. Plagued by riots, overcrowding, poor health and sanitation conditions and a purported thriving black economy, the prison facility has been criticized not only by its convicts, but by Amnesty International and human rights bodies such as the Council of Europe's Committee for the Prevention of Torture. On occasion things have been so bad that inmates have staged hunger and medicine strikes to demand better living conditions and more immediate access to medical care. But before Christodoulos Xiros, became a murdering guerrilla anarchist he was once a musical instrument maker and lived on the Aegean island of Ikaria. Born to a retired priest, Triantafyllos Xiros, and his wife Moschoula, three of their ten children would later be condemned for participation in the 17 November group: Christodoulos, Savvas, and Vasilis. Savvas Xiros was a painter of Greek religious icons. He came to the attention of police following a botched bombing attack on June 29, 2002. Whether from faulty fusing or poor execution, the IED he was handling detonated prematurely. The explosion blinded him in one eye and caused partial vision loss in the other, blew off three fingers from his right hand, burst an eardrum and collapsed one of his lungs. In total, he would spend 65 days at the Evangelismos Hospital in Athens recuperating from his debilitating injuries. Unconscious for four days, when Savvas Xiros came to he started cooperating with authorities, possibly encouraged by Greece’s rulings that enabled terrorists to receive lighter prison sentences in return for cooperation. Later he would recant his statements and imply that his confession was made under extreme duress, while under the influence of psychotropic drugs or "truth serums" administered without his consent. No evidence has been presented which collaborates this allegation, nor his later claims that prison inmates at Korydallos are routinely administered chemical restraints for non-therapeutic reasons. Whether or not his confessions were self-preserving or influenced by state persuasion, Savvas Xiros’ testimony proved pivotal in Greece’s case against 17N and in dismantling the organized crime group. His testimony detailed the history of the cell from its nascent birth in 1975 as a Marxist-leaning domestic terrorism organization to its fateful decision to murder British defense attaché, Brigadier Stephen Saunders June 8, 2000. As a result of Savvas Xiros’ testimony and the testimony of others, including his own brother, Christodoulos Xiros, ten members of 17N would be convicted for their rolls in 23 murders and sent to prison. Prior to his escape from justice, Christodoulos Xiros was serving six life terms, plus 25 years. 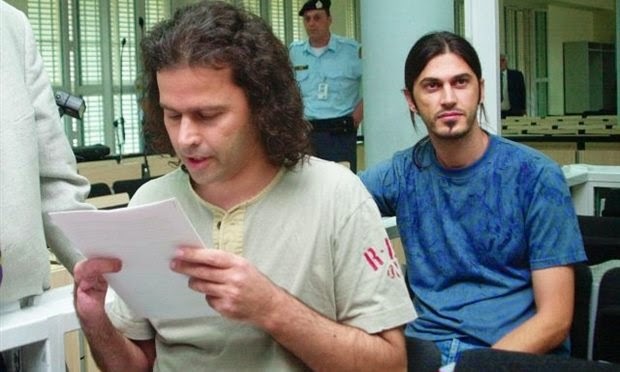 Savvas received five life sentences plus 25 years for his own role in 5 assassinations and Vasilis Xiros, the youngest of the three siblings, was condemned to 25 years for simple collusion to assassinate. But this article’s publication in in ARCA’s blog is not solely to outline the life-cycle of one of Greece’s grimmest terrorist groups. Its purpose is to illustrate that organized criminal enterprise has many diverse elements and sometimes significantly and sometimes casually art crime plays its own part. 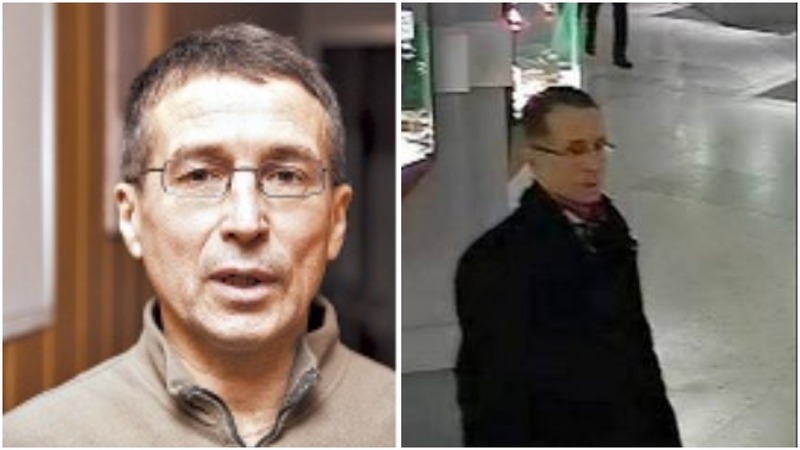 Following Christodoulos Xiros capture, on January 3, 2015 police have begun identifying additional co-conspirators. One has been listed as a 37-year-old Albanian who posed as a Coast Guard officer using the pseudonym “Theocharis Chrysakis” or "Hari Koka". Police have indicated that this accomplice had prior arrest records for gun and narcotics possession. 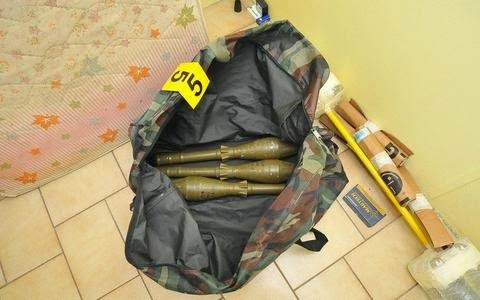 There has also been speculation that Xiros’ stash of weapons and explosives may have been acquired via Greek criminals with Albanian supplier connections, possibly affiliated with this ally. A second accomplice has been reported to be a 54-year-old former law enforcement officer. Greek news wire reports have separately listed the individual as “unnamed” “Christos P” and “Christos Patoucheas” describing him as an ex police officer, dismissed from the EKAM, Special Counter-Terrorist Unit of the Hellenic Police twelve years ago. The reason for his dismissal: involvement in antiquities smuggling and links to extortion rackets. 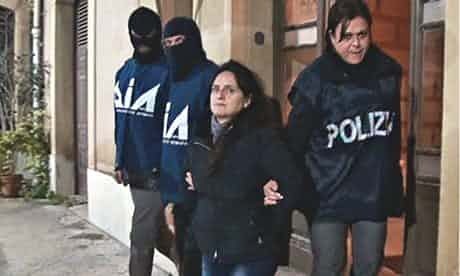 Patoucheas also seems to be involved in a functioning extortion ring operating from within the 6th wing of Korydallos prison which allegedly orchestrated additional bombings. As abettors to Christodoulos Xiros these men now face graver charges than simple gun possession and antiquities trafficking. Each can be charged as a member of a terrorist organization, as well as with contributing to the manufacturing, supply and possession of common explosives and bombs. All of these offenses can be tried under Greece’s Anti-Terrorism Act. But despite the successes of preventing further armed attacks and the recapture of a fugitive from justice, many questions remain regarding this organized crime group. How is it that prison authorities felt it appropriate to grant furlough to a convicted terrorist despite his direct and indirect involvement in the deaths of 23 people? How long has Christodoulos Xiros had this relationship with the former officer of Greece’s EKAM? What are the details of this accomplice’s prior involvement in antiquities smuggling and extortion and is there any correlation between Accomplice One's Albanian arms channels and Accomplice Two's earlier involvement in art trafficking? But before any of our readers jumps to premature conclusions, I am not implying that Christodoulos Xiros’ organization was in any way funded by antiquities smuggling. None of my research, in looking for antiquities smuggling connections to this escapee or his associates has uncovered evidence that would substantiate such a claim. Given the more lucrative profitability of extortion and arms and cigarette trafficking, it would also seem superfluous at best as a potential revenue stream to fund Greek terrorism. My point is merely to underscore, in a thought provoking way, the complexity of criminal behavior and that traffickers, especially art traffickers, are not always tie-wearing antiquities dealers with glossy Geneva free ports and warehouses. Some art criminals are simply opportunistic criminals. They are incentivized to smuggle whatever illicit commodity has a willing buyer. The type of “merchandise” isn’t important. The contraband could be art and antiquities, or drugs and weaponry. The sole criterion is that the enterprising criminal has access to a willing buyer and a steady supply stream of merchandise that supports his market’s demand. I mention this because I think it is important, when examining organized crime and terrorism and its potential connection to antiquities smuggling, that researchers not to fall into the trap of feeding the media’s insatiable desire to see actuarial percentages that calculate the risk, size, percentage, threat, motivation or impact of a specific subset of organized crime, be it terrorism, arms trafficking, cigarette bootlegging or antiquities looting. When we do, we allow the media to skim over the complexity of the subject in exchange for scary headlines that superficially skim the surface and are often based on estimates. 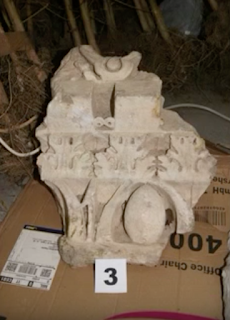 By the same toke art crime researchers should be more comfortable with admitting to journalists “I can’t answer that” or "there is not enough evidence to confirm links between art smuggling and terrorism" in cases like the Xiros investigation, when there is not enough proof available to satisfy the hypothesis. In most cases, the mere mention of the words ‘organized crime’ and the circumstances of real life cases, as complex as this Greek terrorism cell, already have sufficiently powerful details on which journalists can draw readership without the need for supposition. For those that want to take a closer look at organized crime and the difficult problem of assessing its scope, I suggest starting with this 2004 academic article. Produced by criminologists, it gives readers a far greater understanding of the complexity of quantifying organized criminal behavior than I can within the scope of this already overly-long blog post. The article also sadly underscores that despite having been written more than ten years ago, we are still wrestling with the same problems where organized crime information gathering is concerned. The sad truth is that even today conclusions are too-often drawn based on too few cases and estimates rather than harder-to-actually-substantiate data giving the media tantalizing conjecture rather than providing much in the way of concrete evidence regarding a specific subset of criminal enterprise. Part of the reason for this is that researching the mechanisms behind organized crime and any illicit trafficking market is a potentially risky endeavor. Global Initiative estimates that 35% of the journalists killed in the last ten years were reporting on organized crime or corruption. And no matter how firmly experts researching organized crime disclaim unrealistic estimates or over-reaching assumptions it will always be, at best, an imprecise science by its very nature. Measuring something as complex and elusive as organized crime, or specifically organized crime with art-related offenses would require law enforcement to develop a conceptual and theoretical framework that permits the police to gather data on and then measure the types of art crimes in a more meaningful way. Unfortunately we aren't there yet, despite what some media headlines tell you.